In the old days it seemed like the only places people tossed their coins were into piggy banks and the occasional wishing well. 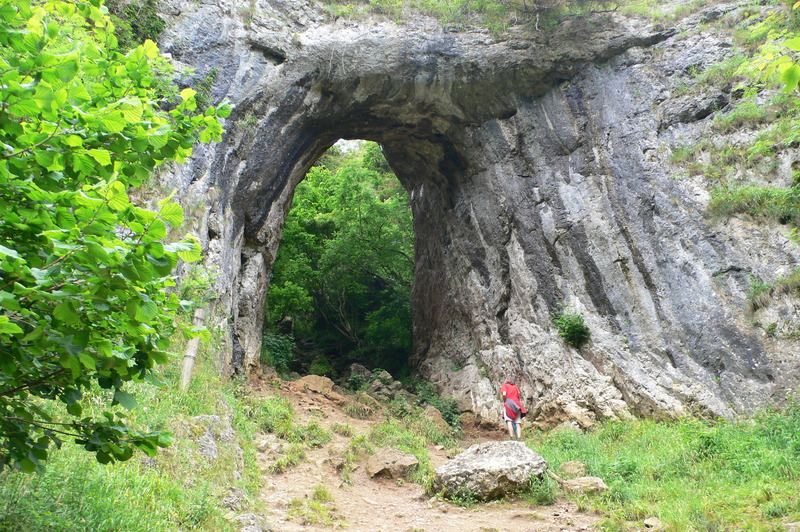 Then, in 2006, I discovered a limestone outcrop with coins all over it, nesting on ledges, wedged into cracks, planted around its base. 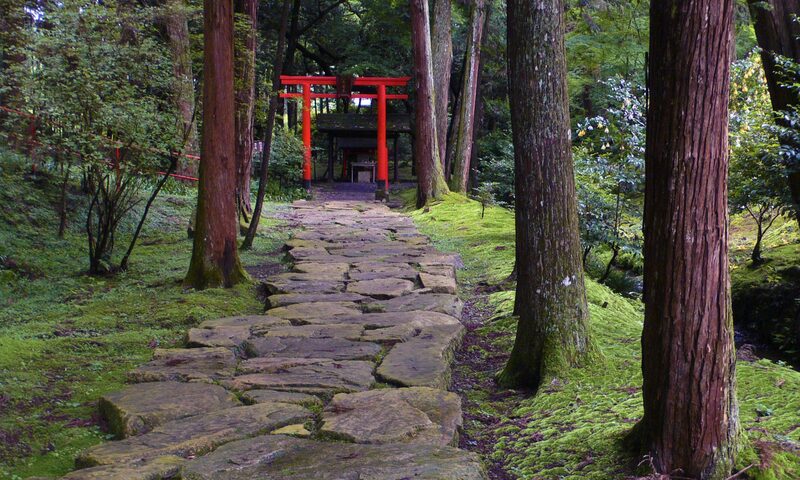 This was at Ishiyama-dera Temple, where, in the 11th century, Murasaki Shikibu reputedly wrote her classic and very entertaining poem, The Tale of Gengi. The coinstone at Ishiyama-dera Temple, near Kyoto, Japan. 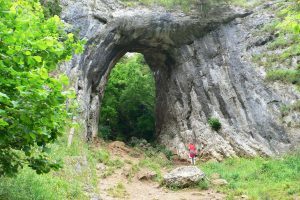 A few years later I came across an even more striking ‘coin place’, this time a fallen tree trunk in Dovedale Gorge, in the southern Peaks District of England. 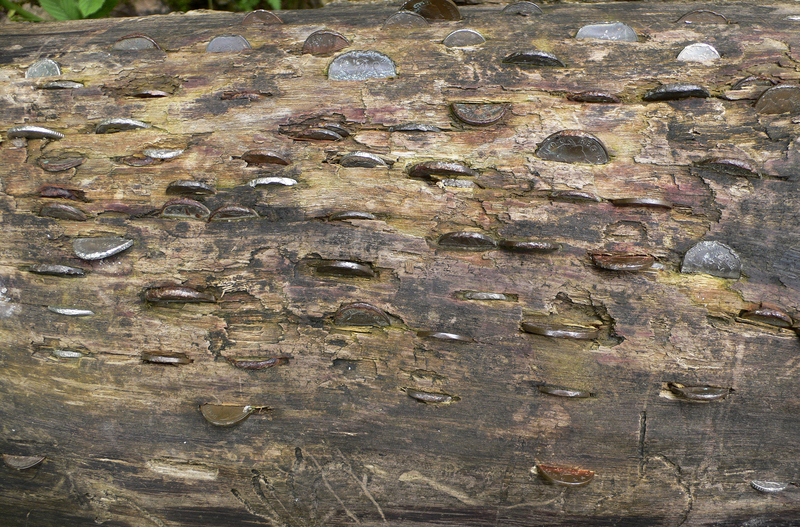 Some of the coins in this were warped and flattened, suggesting they had been bashed into the wood when it was still fresh and hard. It looked pretty rotten now, but I was surprised when I had a go at trying to work a little coin into a small crack. I didn’t get far at all. But why did I want to bang a coin into a log at all, and why had so many people evidently done so already? To be honest, I didn’t really have an answer. 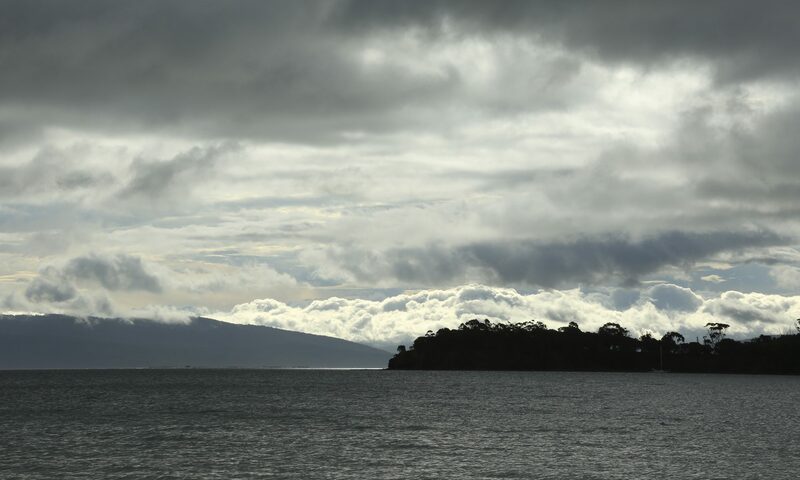 It just felt like the right thing to do in this quite otherworldly, dramatic place. Maybe it would bring good luck. You’ve got to be in it, after all. Coin tree in Dovedale Gorge, England. 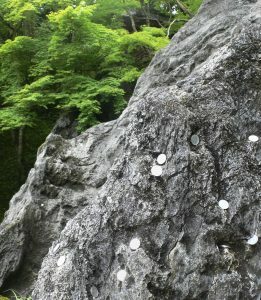 Funnily enough, my discovery of the coin tree in Dovedale Gorge was in 2012, six years after I saw the one at Ishiyama-dera. Now, another six years later, I’ve discovered one more, this time even closer to home. 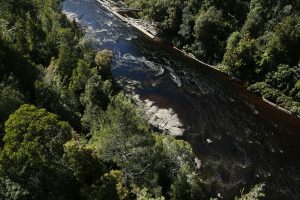 The latest is at Tahune, in southern Tasmania, and can be seen from the Airwalk, a metal walkway some 20 metres up in the canopy of the forest, alongside the Huon River. It is touted as the crowning glory of this great forestry propaganda park. I hate the propaganda, but Tahune is a lovely spot for an occasional visit. 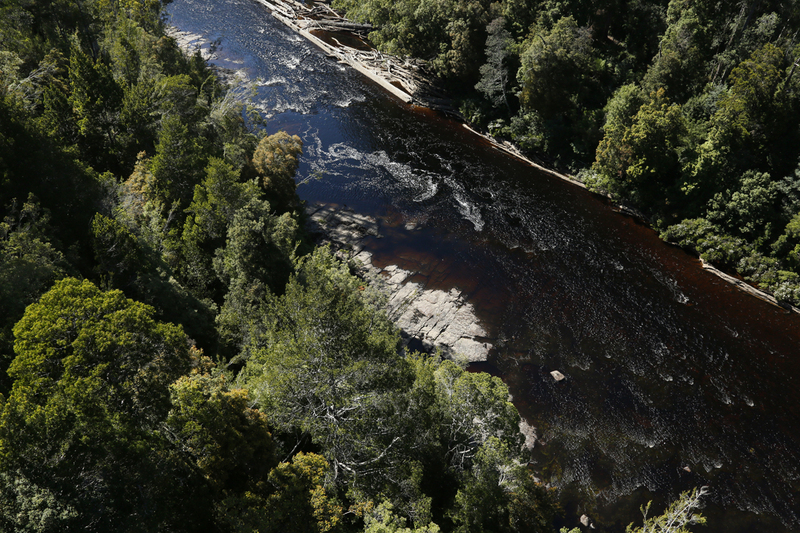 The river and forest there are a reminder of exactly why we should preserve rather than trash Tasmania’s beautiful forests. 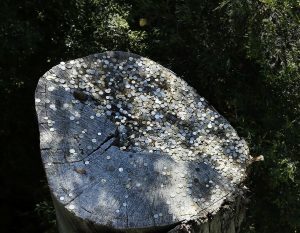 Coin tree at Tahune, Tasmania. As you can see in the above image, the coins at Tahune are on top of a huge stump, the remains of a tree which has been cut off some 10 or 12 metres above ground level, right next to the airwalk. It’s easy to see how people might enjoy the challenge of tossing a coin and hoping it will not only land on top, but actually stay there. I’m not quite sure what I think of this strange form of littering, as it seems to me, coming to Tasmania, but if it brings some luck to the forests, I’m all for it. And, as chance would have it, just a couple of days after discovering the coin tree at Tahune, I found that someone’s written a whole book about coin trees. So, “they’re a thing then”, I thought. The book is called The Magic of Coin-Trees from Religion to Recreation: The Roots of a Ritual, and it’s by Ceri Houlbrook. 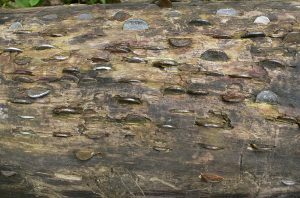 In it, Ceri suggests that coin trees offer an opportunity for people, especially children, to develop a sense of wonder and imagination by playfully engaging with a structure that combines elements of nature and art, folklore or culture. I rather like these sort of innocent and whimsical rituals, and, particularly the idea that it’s not, as Ceri quotes a seven year old suggesting “a waste of money”. Rather, coin trees, or rocks, or ponds, seem to be an opportunity to put money back in its place, which is secondary to an active, imaginative, playful engagement with life. Huon River at Tahune. I wonder how many coins are down there, and what they do to the water quality. Surely not as bad as all the soil Forestry sends off to sea at least.